Posted by Stuart Herbert on November 9th, 2010 in Desktop Wallpaper, Travel Photography. As the light began to fail in Bath last week, the shops started to come to life, their window displays really starting to pop in the gloom of dusk. 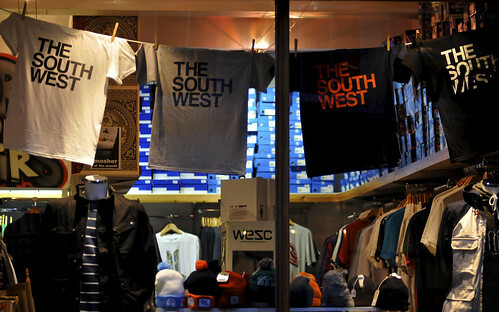 One of my favourites is this display of t-shirts with “The South West” in large, bold letters, and all the depth of the shop behind.